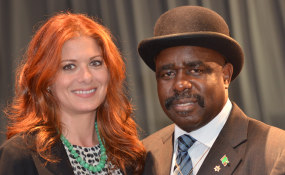 Chief Jonathan Eshiloni Mumena with actress and HIV/Aids activist, Deborah Messing at the 2012 International Aids Conference in Washington, DC. The Bible, science and an 18-year-old boy were the elements that sparked an initiative to curb HIV in a remote area of Zambia along the border with the Democratic Republic of Congo. Fanning the flame is a charismatic traditional ruler, whose efforts have attracted international attention. South Africa's Mail & Guardian newspaper says he "lit a cultural fire." Bill Gates calls him one of Africa's "true heroes". At the biannual gathering of the International Aids Society, in Washington DC in July, Chief Jonathan Eshiloni Mumena mingled confidently with prominent researchers, Aids activists and Hollywood stars, promoting projects that provide circumcision to reduce transmission of HIV as well as the human papilloma virus that causes cervical cancer. His stance is not without opposition, either among his community of 600,000 or elsewhere in the country. An article in the Zambia Daily Mail, published in the capital Lusaka, elicited comments challenging the campaign - but also this approval: CHIEF GO FOR IT DEAR, ITS NICE. In Chief Mumena's area, according to Zambian statistics, one in 10 people is HIV positive. Since the chief began openly saying that he and his son had been circumcised, hundreds of men have followed his lead. AllAfrica's Bunmi Oloruntoba asked him how his teenage son had persuaded him to abandon longstanding community values against circumcision - values he was charged with safeguarding. Here are edited excerpts from their conversation. Tell us who you are and why you took on this cause? I am from the northwestern part of Zambia, in a district called Solwezi. I am chief of the Mumena Kingdom. I assumed the throne on October 1 in the year 2000 after the death of my grandfather. We are a matriarchal society, and so I take the throne through my mother's line. When I went to the village to become chief, I could see that we had vulnerable children everywhere; we had orphans everywhere; we had challenges with accessing medical facilities; we had challenges with accessing clean and safe drinking water; we had challenges with reproductive health. It became very clear that HIV and Aids, which has been around our country from about '84-'85, had taken a great toll on us. I want to say that the HIV/Aids era has been a reign of terror- and that it required action, immediate action. We could not just keep quiet. Thereafter I became an HIV/Aids activist. I was also a reproductive health activist, and this is why you see my white badge: this is the Safe Motherhood and the White Ribbon Alliance Badge. What prompted you to take a role in promoting male circumcision, when your people, as I understand it, have traditionally opposed it. Firstly, let me talk about reproductive health in general. Then we will come to the other specifics. Within a week of my becoming chief, I received news of a woman that died in child birth. As if that was not enough, a few days later we had another woman, due for delivery, who was brought to the health center on a bicycle. We had no ambulances in the area, and we still do not have ambulances. A kilometer before the health center, labour pains came through. She had to get into the bushes where the baby was born. A baby being born in the bushes! I thought we needed to do a little bit more to bring dignity to our community, and our society, and our women. We, being a matriarchal society, attach great importance to women's issues. Now, as you looked at all of those issues, one activity that has been my passion is about preventing new cases of HIV and Aids. Most of our infections in the part of the country where I come from are heterosexual - passed on from man to woman, woman to man. As I said, HIV/Aids has been a reign of terror. We need to take tangible steps to stop HIV and Aids. Enough is Enough. In going about the campaign for male circumcision - I know you are chief, so what you say goes, but was there any resistance? It's about culture. Culture is what defines us. I come from the Kaonde tribe. Of the many, many, many good cultures that we have, male circumcision is not one of them, even though some of our neighboring tribes do male circumcision as a right of passage when becoming a man. But it so happened that one February morning in 2011, my son Benjamin, who was then 18 years old, walks up to me and says, "Daddy, I want to go for male circumcision." Now, that was not an easy situation for me. As chief of our people, I am the custodian of their norms and cultures. He says he had been talking about it with his friends; that it would prevent him from getting HIV and Aids easily. Of course, it was a real shock to realize that my son was already becoming a man and thinking about things we don't normally talk about culturally. So I got in touch with an organization called Society for Family Health Zambia. They gave me a lot of information about the fact that circumcision could prevent you acquiring HIV/Aids by 60 percent.There was no cure, so to think that we had a program that would prevent, even by 60 percent, was great news indeed. That was the beginning of my research as an HIV/Aids activist. And they told me that it was one strategy to prevent cervical cancer in the ladies, because it is scientifically proven that most cases of cervical cancer are passed from the males to the females through a chemical that is found in the foreskin of the male. It became clear that we are not going to do circumcision as the right of passage, but we are going to do circumcision in order to survive, in order not to be wiped out. You've said that you faith played a role in accepting your son's request. I thought [circumcision] was just one of those things the Old Testament preaches. But I began to realize, if God said it was good enough for his people, then it should be good enough for us as well. And I begin to wonder, "Why did I not think about it?" I will tell you that the North-Western Province has some of the tribes that do male circumcision. And as I talk to you now, North-Western Province has the lowest prevalence rates in Zambia, because we have male circumcision rolled out up to around 71 percent, and other provinces are about 40. We have the lowest HIV rates, and we also have the lowest rates of cervical cancer. This is just one of the reasons that have gotten me closer to the fact that male circumcision is the real answer. Yes, I do realize you don't do away with the other combinations, but I think that it is the best way to go for now. What became the bigger challenge was how to break the news to the people, to the elders. It was like putting my head on the chopping board. But, with the help of caring friends at the Society for Family Health, they brought in brochures, they brought in information, they called a big meeting. They issued out leaflets and generated a debate. The women were included, the men were included, the youth came in. So then we realized that many people were interested, but they didn't know where to begin from to talk about this thing. That gave me a lot relief that at least we had some way. And right after those discussions, others suggested that they were going for this procedure right now. Has the government been supportive? Is there collaboration between the government and community leaders such as yourself? That is an interesting question. The good thing that has happened is that the government of the Republic of Zambia, through the ministry of health, has come up with an announcement that declared August of 2012 as the male circumcision month, and that the goverment health centres are going to roll out this procedure free of charge - and that the other private providers like Society for Family Health, are going to do it for free, in the sense in that the client does not pay anything. So I think that is one support that I have seen from government in the last two weeks. Secondly, we have a house of chiefs. This message has been given to the house of chiefs of Zambia - which is like the parliament of chiefs - to consider rolling out male circumcision amongst the other tribes in Zambia that do not do male circumcision. So there is a lot of support. If there is anything else, I want l to see government roll-out training of male circumcision providers. It means the re-training of nurses, the re-training of doctors, the re-training of clinical officers and providers of this services., and if government would be able to roll this out, it would be helpful for staff, human resources. Government would be helping us tremendously if every rural health center was given the capacity to roll-out this procedure. Right now we have people in my kingdom walking 20 kilometers, 30 kilometers, in order to access a health centre. Is there anything else you would like to say to AllAfrica's viewers? What I would say is that male circumcision is not like: no one has got a magic bullet. No, no, no. And it doesn't mean that one now needs to be irresponsible, thinking they have permanent immunity - no. And we would want to think that you, the media, could help us to break the silence and the stigma. We know that many people today in fact look at male circumcision as a barbaric occurrence or doing. But we know it is not a barbaric ritual; we are doing it to save lives. So I think that the debate must be rolled on, and we need leadership.